Limited Signed copies of How To Be Rich and Happy On sale now! For the last month or so I’ve been working with Tim Brownson, John P. Strelecky and their fantastic team in the launch of their book How To Be Rich and Happy. 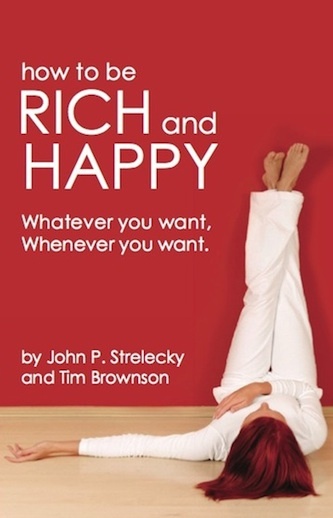 I know a number of people who have rolled their eyes at the title: “How to Be Rich and Happy”. They tell me it doesn’t exist, or it must be a get rich quick scheme or some kind of airy fairy new age internet fad that has no place in the real world. They tell me that it won’t work / can’t work / mustn’t work. They will go to great lengths to rubbish the concept of riches and happiness. But the one thing they won’t can’t do is break the rich and happy formula. Because the people I see who have tried the Rich and Happy formula have changed their lives for the better andit has put them on a happier and richer path. How to be Rich and Happy IS different. It doesn’t expect people to be perfect examples of productivity and efficiency. It knows we have hang ups, we procrastinate about things, we worry about things. It shows you how to live and rich and happy life, not in spite of our own little personality quirks, but because of them. It works with you to find out what is really important to you, and then shows you how to get it. The pre-sale launch of how to be rich and happy starts TODAY and as an introductory offer, they are selling the first 750 copies at a bargain price of $19.99. Each copy will be personally signed by John and Tim and I know they are flying off the shelves so I really would move fast to get your first edition copy. For every copy sold, the money raised goes towards the 1 million book giveaway which is a cause that is going to set the world on fire and you can be a part of it. All I’m going to say at this stage is that you should buy this book. This book has already changed my life and continues to do so. I’m going to send you over to their site now to find out How to be Rich and Happy can change your life. Hi Tim, it’s been an absolute pleasure working with you on this and will continue to help out as long as the Rich and Happy cause needs me! Hey Amy, I just saw this in my Google alerts. Thanks so much for this post and also for your help in the project, you have been an absolute superstar and I look forward to sending more work your way!